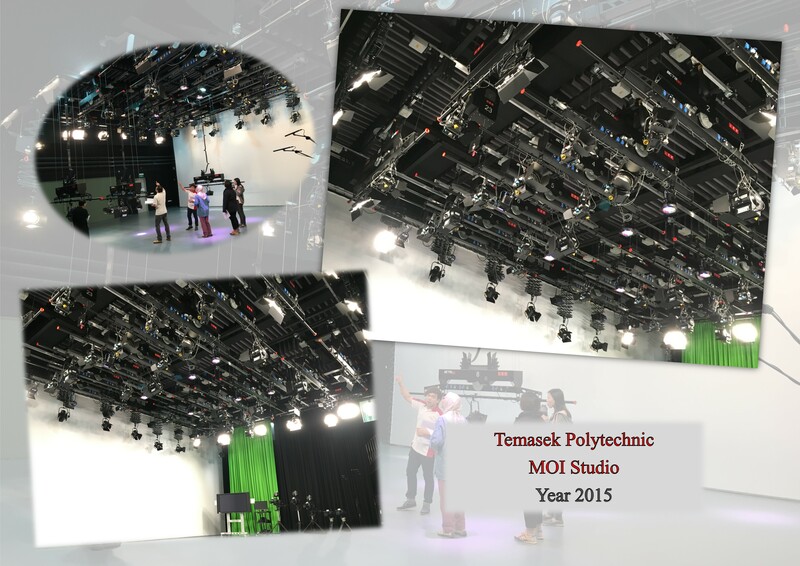 We are very proud to be involved in the Design and Installation of the Turnkey studio lighting system for MOI Studio located in School of Design at Temasek Polytechnic. With the fast development of Professional Broadcast LED fixtures, we are now able to fully replace the conventional tungsten halogen fixtures to LED version, without compromising on the power and quality of lights! This move has certainly contributed to energy saving and the school’s effort to lessen carbon footprints! AVLite has provided 48 nos. of LED fixtures, consisted of Quartzcolor X-series LED Fresnels, ETC Source Four LED CYC and groundrow, ETC Desire LED Wash fixtures. The suspension system is made up of 20 sets IFF self-climbing hoists, 6 sets IFF scenery hoists and 24 sets of IFF Pole operated pantographs. All motorised hoists are wired up to a centralised hoist control panel complete with a wired remote control. The drapery system consisted of a dual aluminium curtain rails. One meant for cyclorama backdrop with 2 tensioning frames and a bottom tensioning frame. This 4-sided tensioning system allow the cyclorama to be fully tensioned giving the best effect! The black wool serge curtain and green chromakey curtain are shared on the other curtain rail, allowing users to draw the required piece of backdrop to suit their production needs.